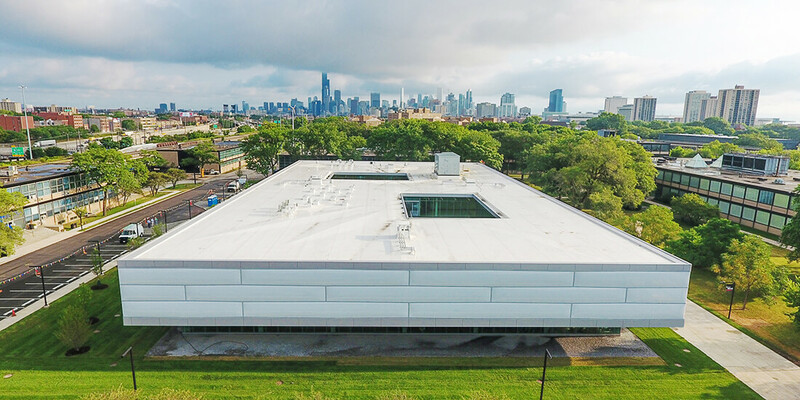 The 70,000-square-foot Kaplan Institute building appears to float in the surrounding Mies van der Rohe–designed Illinois Institute of Technology campus. Courtesy Howard Tullman. Standing with three classmates at a podium in the newly opened Ed Kaplan Family Institute for Innovation and Tech Entrepreneurship at the Illinois Institute of Technology, Kislay Bhagat, a fourth-year engineering student, gestures to the windows while tapping on his Android phone. Seconds later, an omnidirectional hovercraft—one that looks like a child’s disc sled—lifts off the ground and glides smoothly along, floating inches above a pedestrian sidewalk. Bhagat’s team built the machine for an Interprofessional Project (IPRO) robotics class that meets in a new, 72,000-square-foot, cloud-like building designed by John Ronan Architects. A lightweight, interstellar take on the architecture characterizing the Mies van der Rohe–designed campus that surrounds it, the Kaplan Institute is the school’s first new classroom building erected in 40 years. Learn ways automation is shaping the future of work. A serial entrepreneur and former CEO of Chicago digital startup incubator 1871, Tullman is hardly a Luddite. In his office, two smoothly curved robots idle in the corner (they can identify Tullman by face and say hello), and David Bowie’s face swims in an expressionist pastiche behind his desk. During his tenure at 1871, Tullman helped woo hundreds of tech companies into Chicago’s business district, watching the city’s tech sector grow dramatically from 2012 to 2018. He also led 1871 to its current stature as the number one university-affiliated incubator in the world. As digital startup incubators like 1871 have emerged to develop new products and services, the labor market has changed. Employers are no longer enticed by candidates with encyclopedic subject knowledge: They’re seeking students with real-world design experience and transferable soft skills. These could include the ethics and social etiquette of working in a team, the entrepreneurial mindset to sell an idea to stakeholders or funders, and the lab-based practice of designing prototypes and models. The Kaplan Institute seeks to cultivate these types of skills. Architecturally, the Kaplan building is in many ways a physical embodiment of the institute’s mission to prepare students for the jobs of the future. Enveloped in partially obscured ETFE (ethylene tetrofluoroethylene) material and bearing a larger footprint than the first level, the building’s second floor appears to hover weightlessly above the earth. 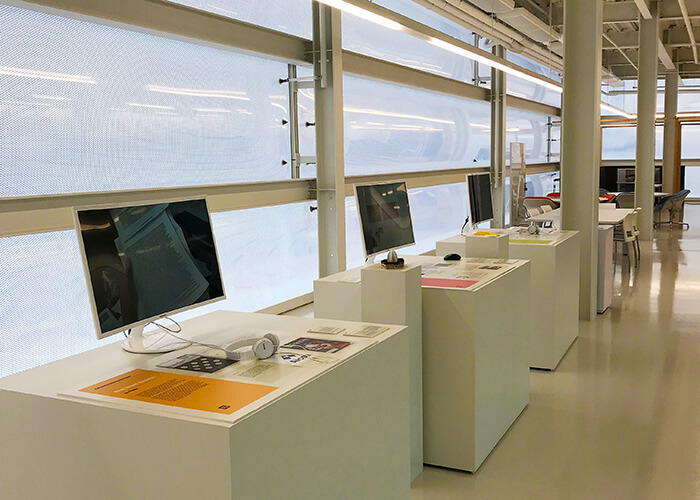 The interior is lightweight and airy with wide, all-white corridors that wend past lounges, conference rooms, presentation areas, design studios, crash pods, makers’ labs, a community kitchen, and a café. A row of workstations inside the Kaplan Institute. Courtesy Jeff Link. The first floor is programmed for IIT undergraduates, who are all required to take six credit hours in the building. The second floor houses the Institute of Design, a post-graduate-level design school started by Laszlo Maholy-Nagy. The Bauhaus-inspired vision Maholy-Nagy had for the school, one that would unify art and industrial design, is alive and well in the building. 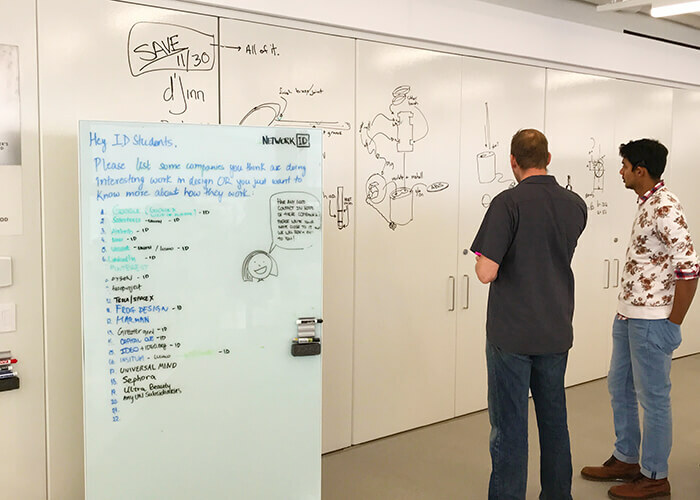 In a real sense, the physical structure is a canvas for creating and refining ideas: Equations, sketches, and workflows are scrawled on walls serving as large-scale dry-erase boards. Mobile whiteboards also allow work and ideas to move freely. In the Janet & Craig Duchossois Idea Shop and Grainger Maker Space, students design and create models with 3D printers, CNC routers and mills, laser cutters, bandsaws, electronics workbenches, oscilloscopes, and Autodesk Revit and Inventor software. KI students collaborate on dry-erase walls. Courtesy Jeff Link. Kaplan Institute opened in late October 2018; it remains to be seen how students will fare within the institute’s walls—and post-graduation. Tullman acknowledges that other university tech incubators, while well-intentioned, have not always lived up to their promises. “Most have not been particularly successful because there is not a lot of tension,” he says. “Professors work with a safety net, and universities are risk averse and don’t have well-developed processes for the monetization, or commercialization, of ideas,” he says.